Looking for a great vacation rental or second home? This condo could be it! Offering a first floor end unit that is very close to the pool and lazy river. This unit features two double beds with a dresser and storage closet. Featuring all tile floors throughout for easy cleanup from your day spent at the beach. There is a nice kitchen/living area. The kitchen includes appliances such as refrigerator, stove and microwave. The cabinets are a pretty white color and have a good amount of storage. In the living area you will find a couch, chair, table with lamp and coffee table. The bathroom has a tiled shower and a large mirror and vanity. Relax outside on your patio that offers an extra brick area with a nice view of the pool! 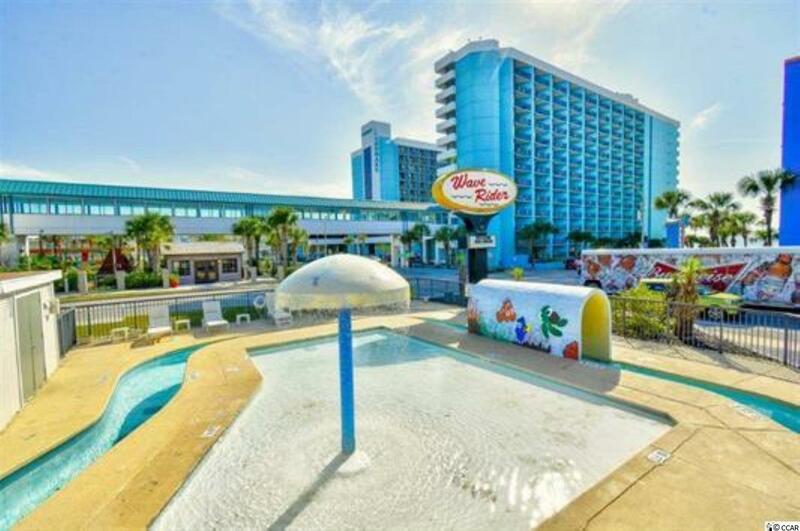 The Wave Rider Resort offers plenty of family friendly amenities and is located directly across the street from beautiful Myrtle Beach. There are many amenities including outdoor pool, indoor pool, kiddie pool, lazy river, shuffle board deck, kids swing sets, grilling areas, fitness center, convenience store and a media room. Close to all the dining, shopping and entertainment that Myrtle Beach has to offer! Directions: Via Us-17 Business N. Slight Right Onto S Ocean Blvd/Sc-73. 1600 S Ocean Blvd Is On The Left.